While there is a massive chunk of the this site’s audience already very familiar with what each bit of a guitar is, this article is really aimed at those who might be just starting their guitar journey (or even just thinking about it). This first article in Guitar 101 is a primer (or a refresher if you want to do a little revision) to ensure we all know the basics before we start moving on to look, in more detail, at all of the bits of a guitar. For that reason, some of you may want to gloss over or skip this article. Feel free to do so – it’s to get everyone to the same starting point before moving on (and it’ll still be here later should you ever feel the need to go back). Lets start at the very beginning – What is a guitar? A guitar (or bass – I’ll use guitar as an umbrella term, though) is essentially a device for amplifying the sound of a strings vibration. In a nutshell, that’s all a guitar does – it amplifies (either through an electric guitar’s pickups or an acoustic guitar’s sound box) the sound of the vibrating string. Now, of course, it also provides a means to tune that string and a means to selectively change the pitch of that string (by fretting) thereby allowing different notes be played. Despite different shapes and sizes, guitars generally share a standard set of characteristics. 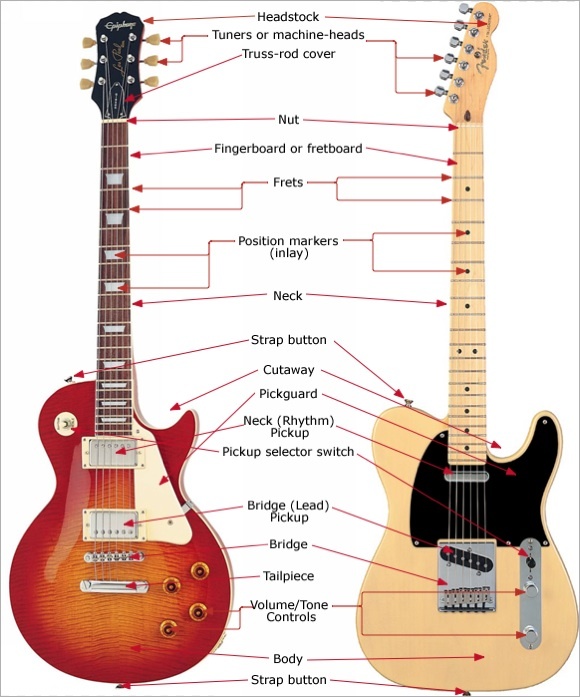 In the image above you can see that despite minor differences, the two guitars are essentially based on the same principles. We’ll take a quick overview of these principles below – don’t worry if we don’t explain all the terms now, we’ll be covering it in more detail later on. The guitar’s strings are anchored at each end. At the top they’re anchored to tuners which allow the string tension be varied, thereby ‘tuning’ the string to the pitch required. At the body end, the strings anchor in a bridge or tailpiece (and sometimes through the body itself). Between these two anchor points, the string passes over two points: the nut (at the end of the neck) and the saddle (the saddle is the string contact point at the bridge). The distance between these two points is the ‘scale length‘ of a guitar. Many saddles/bridges are adjustable to allow for string-length compensation. The pitch of any string can be changed by fretting it against the fingerboard with a finger. Frets are thin metal bars installed in the fretboard at precise positions to ensure accurate pitch. The sound of an electric guitar is generally amplified electronically. The pickups sense the strings’ vibration and convert it to a small electric current. This travels down your guitar cable/lead to an amplifier where it’s turned into a bigger current – one sufficient to drive a speaker. Acoustic guitars are pretty much the same. The strings are anchored at the body end – through holes in the bridge and top – with bridge-pins. In most cases, the acoustic guitar saddle is not adjustable for compensation. The saddle is generally made from the same material as the nut (often bone, or a plastic). 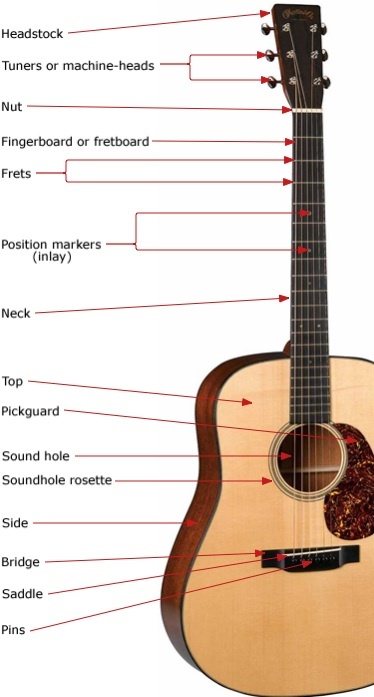 In the case of an acoustic guitar the string’s vibration causes the guitar’s top to vibrate too. This moves the air inside the guitar body (or soundbox) which is what causes the sound to be ‘amplified’ or made louder. The moving air comes out through the soundhole and the listener hears it. Over the coming weeks, Guitar 101 will take a closer look at many of the component parts of a guitar and examine what they do and why they’re there. We hope to give you an understanding of why a guitar is the way it is and how it works. Guitar 101 will provide some of the theory behind the practical parts of our upcoming Guitar Setup articles.